When a government takes a deliberate and dangerous step to segregate itself and its ethnic base from the rest, the implications are far bigger, deeper and more dangerous than the State of Emergency the TPLF dominated government declared on October 9, 2016. This segregation confirms what the majority of the Ethiopian people have been saying for the past quarter century. The TPLF’s imposition of ethnic-federalism whose sole and primary purpose has been to facilitate state capture of politics and economics has undermined Ethiopia’s remarkable history of independence, territorial integrity and the bonds and unity of its diverse population. Ethiopia’s decline and potential regression towards a failed state like Somalia is a direct consequence of the centrality and supremacy of ethnicity over citizenship and shared prosperity, separatedness (áŠ­áˆáˆ) over a multinational state called Ethiopia. The State of Emergency manifests this tragic division. Dictators survive because they have allies. They have allies because they serve someone else’s national interest as a policeman at enormous costs to their own societies. State level thieves receive billions from their allies, siphon-off billions in the process, squander hundreds of millions in projects that are not well studied and do not add value to the society, hide their stolen billions, kill hundreds etc. with impunity. They hide billions in illicit outflow because there are places to hide them; or to invest them in clever ways such as houses, real and make-believe businesses and other non-traceable assets often under pseudonyms and family members. These billions enable them to repress citizens. Ethiopia has lost billions of dollars in illicit outflow; and will continue to bleed until and unless there is a regime change. Ethiopia’s so called remarkable growth over the past decade is not self-generated. It is not the creative and imaginative outcome of a caring and prudent regime. The TPLF elite captured the state and imposed a Constitution with the façade of democratizing the country. Among other things, it declared itself as the champions of oppressed nations, nationalities and peoples. 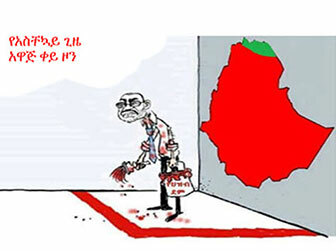 It offered the “oppressed” self-administration while ensuring that one party, the TPLF controlled the levers of power. This party became a king-maker, creating ethnic and other parties obedient to it; and decimating independent parties, free media and civil society. The institutions it created deliberately and systematically became instruments of the one party state. Pretenses of multiparty democracy, a free and independent press and civil society in the first few years of the current regime notwithstanding, the TPLF and its ethnic allies within the EPRDF had never wanted to yield political power to anyone else. Why? The TPLF determined far in advance that its ability to capture the state and the economy depended on applying the military discipline of “command, control, communications, and increasingly, computer systems.” This doctrine is defined as an “Integrated systems of doctrine, procedures, organizational structures, personnel, equipment, facilities, and communications designed to support a commander's exercise of command and control across the range of military operations.” For the past quarter century, the TPLF has applied this well-tested technique for the benefit of its members. The merger of party, state and government is therefore natural; and those who question this model considered inimical. For this reason the TPLF and its allies in the EPRDF have never been nor will ever be democratic. When political capture endows you with an unexpected enormous wealth, the chances that you will share power through peaceful means is almost nil. Statistics and the alarming disparity in wealth and income show that the TPLF/EPRDF regime is one of the worst rent-seeking regimes in the world. It is the worst in Ethiopian history! This is why it has a high proclivity to create its own parties and undermine those it can’t control or buy. This is also why it established a party and state media that serves as its mouth piece while undermining the public good. It criminalized free and independent media; bars access to social media such as Facebook; and dismantles television and radio dishes so that people do not watch ESAT and OMN; and disallows peaceful protests. Why are ESAT and OMN feared and barred? Because they enable ordinary people to express their voices without fear; and transmit information that regime media does not dare to present. Unlike episodes of resistance in the past that were led by elites, this time the TPLF/EPRDF is fighting a losing battle. It is fighting the very people, especially youth that it had said it serves. When millions of Ethiopians say, “Enough to the TPLF! Enough to the EPRDF!” they mean they want regime change. When the people of Gondar in the heart of Amhara land -- in their tens of thousands say “Do not kill our Oromo brothers! Bekele Gerba is our hero! And their fellow Oromo reciprocate, this phenomenon is transformative. Millions of Ethiopians are denying the TPLF/EPRDF the ethnic card it used so adeptly and systematically. The people of Gondar went further than any other group. They rejected the TPLF/EPRDF flag and replaced it with Ethiopia’s recognizable flag. They accepted their core identity as Amhara while placing Ethiopia as central for their future. They called on others to unify their forces as Ethiopians. This is not because they sympathize with the Dergue. Many Gondaries died fighting it. This is not because they want to restore the Imperial system. Gondaries gained literally nothing under the old Imperial regime. They gained literally nothing to speak of under the TPLF/EPRDF. On the contrary, they lost their lands, honor, dignity, identity and more. When you lose everything, you have nothing more to give. The same is true in Oromia. Oromia gives more to the TPLF/EPRDF than it receives. The regime continues to deny these root causes. The TPLF/EPRDF regime is unfair and unjust in pronounced ways. Ethiopia’s inequitable growth is entirely a result of billions of dollars in foreign aid, billions in remittances, billions in foreign direct investment and billions in soft and low interest commercial loans from China. I don’t think it will be farfetched if an impartial observer would argue that Ethiopians do not own their country or their natural resources or their lives. The country is trapped by a plundering ethnic elite with a voracious appetite and globalization over which citizens have no say. Ethiopians are also at the mercy of a surveillance, repressive and costly state and have been for the past quarter century! This enormously costly state that deploys one spy for every 5 Ethiopian has to go! Its value-added to the society is nil. This is because, by all accounts, it consumes without producing a dime! Free and independent media is anathema to the regime. The TPLF dominated regime repeats mistake after mistake. It has never learned and won’t ever learn that failed policies never lead to viable solutions. It is crushing the economy because enormous resources that the country cannot afford are being channeled to what I call the “war front.” Economic transactions have stalled. Hotels and other establishments in Bahir Dar and other towns are “closed” to customers. There are no customers. More and more businesses will shut down in the months and years ahead. The recovery from the adventurist and irrational polices and activities of the TPLF/EPRDF state and government against its own citizens will be felt for years to come. Poverty will deepen further. This ill-conceived State of Emergency will never address and resolve the root causes of the resistance or revolution. On the contrary it will worsen the situation in multiple ways: social, spiritual and psychological, economic, political, regional security and environmental. Restoring faith in government and its institutions will take decades. Why? Because of the massive bloodshed and the destruction it has caused. Foreign investors are unlikely to flood Ethiopia. As I highlighted in a previous commentary, the new State of Emergency is not new at all. De facto state repression, killings, enforced disappearances and jailing is a common practice under the regime. The State of Emergency gives this de facto activity a legal status (de jure) in the form of a proclamation! I ask myself this question. “What is the end game of the TPLF dominated regime?” How many innocent Konso, Amhara, Oromo and other young Ethiopians must die or go to jail etc. in order to halt the hemorrhaging? Is the intent what people suspect, namely, if the TPLF does not continue its hegemony it would care less about the destruction of Ethiopia? That will be stupid! Given the danger I see, I argue that no sane leadership of any country wages war and applies a reign of “terror” against 96 million people and expect to survive. Why 96 million? The State of Emergency does not apply to the chosen Tigray region. This gives the impression that Tigray is like a separate country! The state’s military might is housed here, out of sight from the rest of Ethiopia. The resources to support this might come from the rest of Ethiopia. What is scary and dangerous for Ethiopia and its millions is this. The State of Emergency defines and depicts the danger zone, Red, to apply to all of Ethiopia except the coveted and protected region of Tigray. The contrasts between this region and the rest depict the danger the country faces. Think of the situation at a human level. Mothers in the Red Zone spend sleepless nights because their sons and daughters face danger each and every day. You will find that for a family in Addis Ababa, Amhara, Oromia, Gambella, the Omo Valley and other locations grief is and will continue to be a daily occurrence. Ordinary Tigreans should reject this phenomenon now! This is because an Apartheid system of separation will worsen the situation. The state of emergency makes citizens captives in their own homes! Imagine that. You dare not show any movement out of your home during curfew unless you want to be killed by a sharpshooter, at minimum arrested. The state has criminalized foreign and independent media such as ESAT and OMN. You dare not open these two unless you want your satellite dish snatched and your life threatened. Security goes house to house dismantling satellite dishes, entering homes to pick up “agitators.” In the Amhara region, especially Gondar, the TPLF army and federal police launched a campaign to disarm peasant farmers. The might of the state against citizens is so overwhelming that one would think that the region is a “war zone.” In Oromia, the state of emergency has been used to arrest thousands of Oromo suspected of “insurrection” and destruction of property. As the epicenters of the popular grassroots level resistance, the two regions bear the burden of the TPLF assault. None of the human rights conventions---the Universal Declaration of Human Rights, Conventions against Genocide--- is respected. Most observers feel strongly that the single most important issue that should be resolved is political and economic capture by the TPLF; and its determination to maintain the status quo at any cost. The cost may even mean the Balkanization of Ethiopia in line with Article 39 of the Constitution. I repeat, the destruction of Ethiopia will cost each and every Kilil including Tigray! The flow of massive aid, investment and remittances will stop overnight. Thus far at least, evidence shows that the regime and the country are heavily dependent on foreign benefactors that care more for regional stability and profits and less if citizens are dispossessed or massacred by their own government. To them, the deaths are mere statistics as much as they are to the regime that kills, maims, wounds and incarcerates without let up. These entrapments must go. One of the least understood and appreciated aspects of the TPLF that makes and dictates policy, investments and the dealings with ordinary citizens is this. Unlike its predecessor, the Socialist Military Dictatorship or the Dergue that killed or facilitated killings of an entire generation in broad day light and for political reasons, the TPLF is much more secretive and conscious of its international public image. It carries out silent killings, maiming, wounding and “enforced disappearances” under cover. No one really knows how many political civic, professional, religious and other dissidents are killed and buried in the country. These are routinely done out of sight by the most trusted agents of the party. The State of Emergency will strengthen the capacity to kill and maim etc. In effect, Ethiopia has been under a state of siege and under a state of emergency at least since the election of 2005. Simply ask yourself how many leaders and activists of multiethnic parties and others have been selected and killed, wounded, tortured, jailed, forced to flee or “enforced to disappear?” How many spouses, mothers, sisters, aunts and uncles have been crying or wondering where their beloved ones are buried or held. These episodes have intensified over the past 11 months. Grieving has become a norm. It is a consequence of a quarter of a century of relentless assaults by the surveillance state and government of the TPLF/EPRDF. The response is the current popular resistance and revolution that show a determination to bring down the system that criminalizes dissent of any kind. To my knowledge, neither the leaders of the Dergue nor the TPLF/EPRDF felt obligated to ask themselves what the end game is! Does anyone know the end game? Is it to kill more; if so how many? Is it to destroy the country? If so, for whose benefit? Is it to stimulate ethnic conflict? If so why preach to us that the country is at “risk” when the regime is the very one that causes it? Who is responsible for the risk? It certainly is not the youth who sacrifice their lives for freedom, justice and the rule of law. Is there anyone within the ruling party who has the courage and stamina to challenge the dangerous assumptions, prescriptions, scenarios and unintended consequences? The conference held in Addis Ababa recently does not offer hope. While dissenters offered a plethora of solutions, the governing party failed to produce anything new or constructive that offers confidence to the very people who brought the regime to its knees. It is because of them that the State of Emergency was declared. In my estimation, the TPLF/EPRDF is not only anathema to Ethiopia’s durability and the peaceful coexistence of its 102 million people; it is also its own worst enemy. First and foremost, it does not believe in democracy. It does not entertain differences in ideology, world view and alternative governance. Its ideology and values are dated to the point of irrelevance. The leadership is delusional. It believes that nearly 96 million people will succumb to its will. At one point, its foreign benefactors will abandon it if and when they are assured of a better and saner alternative. The regime created, promoted and institutionalized ethnic antagonism (kilil) as an instrument of longevity. In the process, it implanted the seeds of its own destruction. The State of Emergency shows that the regime’s leaders are incapable and unwilling to learn from their own mistakes, the mistakes of their predecessor and the failures of other dictatorial regimes. In my estimation, brute force is never a rationale response to public anger and grievances. It did not serve former dictators in Egypt, Libya, Tunisia, the Philippines and Syria etc. It won’t serve the TPLF/EPRDF regardless of the human cost and the use of force to subdue millions of Ethiopians. In a commentary CNN’s Farai Svenzo showed the massive Irreecha on October 2, 2016 and its aftermath. He commented that human rights abuses of the Oromo have persisted under various regimes and have reached their limit. In his own words, protests have “snowballed.” A wise government leadership would have allowed the celebration to go on without interference regardless of whether activists protested or not. They did not harm any person. They did not throw stones let alone shoot at anyone. The quarrelsome regime reverted to the tool it uses routinely. It began to shoot to kill and caused a stampede. The stampede caused by the regime itself tells us the story. People do not trust the regime’s security, federal police or military. They perceive it as killing machine! Why? Because the regime has done this over and over and over again. In other words, the regime sees the citizens it rules as its enemies in every situation regardless of ethnicity or religion. Its proclivity to kill is well established. Dissenters and protestors alike see it as a killing machine. For this reason alone, it cannot survive. Because it can’t kill millions and get away with it this time. Millions of Ethiopians are saying that 25 years of brutality, savagery and plunder is enough! My conclusion in this commentary is this. The state of emergency is not declared to protect citizens from the state and government. It is declared to protect the governing party, its members and supporters as well as its investments from Ethiopians citizens. People do not wake one morning and say “We are going to demonstrate and die doing it! We are going to destroy this property today and that tomorrow!” They must have a cause built over time. The TPLF/EPRDF abused human rights before the latest emergency; and will intensify this abuse. This time, it will do the assault without let up under the guise of a proclamation that licenses it to kill, arrest, “enforce massive disappearances” and force people either to flee or to fight to the bitter end. How sad for the country! How sad for the Ethiopian people! How shameful for the TPLF/EPRDF! Why not opt for the least cost way of accommodation, peace and reconciliation! Allow freedom of choice! Dare to compete in the open market of ideas! On October 12, 2016, an editorial comment in the Washington Post put the matter clearly and questioned America’s and Europe’s position and policy towards the regime in Ethiopia. In “State of Emergency: Ethiopia’s rulers answer protests with bullets,” it opined thus. “Ethiopia’s rulers have redoubled a repressive policy that is failing. Instead of looking for ways to alleviate the pent-up frustrations of the ethnic Oromo and Amhara populations that spilled out in demonstrations over the past 11 months, Ethiopia’s authorities on Sunday announced a six-month state of emergency, allowing the deployment of troops and bans on demonstrations….the state of emergency will bottle up the pressures even more, increasing the likelihood they will explode anew.” Incidentally, my commentary last week under the title “Ethiopia Faces Imminent Danger” asserted an identical view. Repeating a failed policy over and over again worsens a bad situation. The current State of Emergency of hunting for those who advance freedom, justice and the rule of law is a far cry from responding to the systemic crisis in a responsible and accountable manner. This time, the TPLFs/EPRDF’s make-believe story of a failing state and government crashed before landing. According to the Post’s timely commentary, “Attempts to point to foes abroad masks the truth that unrest is being fueled by a deep sense of anger at home…the EPRDF, the target of the rage, would do better to confront the root causes than answer with bullets and tear gas.” As indicated in my last commentary, “The violence threatens to shake foreign investment that has been the pillar of Ethiopia’s development” and the source of wealth for members of the ruling party and its loyalists. Who in the world trusts a regime that is rejected by tens of millions of Ethiopians? The root cause of the current crisis that the ruling party is unable to face includes land grab and annexation, identity, gross human rights abuses, relentless suppression and oppression, incalculable atrocities and crimes against humanity, bribery, corruption, insatiable appetite to use power and the acquisition and illicit transfers of undeserved wealth. Enough is not in the regime’s vocabulary! Compromise, disclosure, accountability to the public, free and independent media including Facebook, competitive parties, an open and competitive economy deter rent-seeking, corruption and ethnic favoritism. These are enemies of the party, state and government. In her recent state visit to Ethiopia, Chancellor Merkel of Germany refused to address the timid and unrepresentative Ethiopian Parliament; and urged the regime to change its ways. Germany should refrain from training Ethiopian security or other forces for now. The United States should now consider the real and moral hazards it faces in Ethiopia and the rest of Africa. In summary, it is now time for the U.S. and the EU, together, to stop bankrolling one of the most repressive and corrupt regimes on the planet. When they do, the Ethiopian people together can and shall advance their collective welfare and deter terrorism. Ethiopians together possess the potential to transform their country’s poor and backward economy into a prosperous one. The rest of us should not be mired by a cycle of unproductive competition for power and glory. Instead, the historical demand is for each and all of us to do what is required. This is to work together for the common cause of ushering in a new era of genuine democracy; and a transitional arrangement that will get us there.